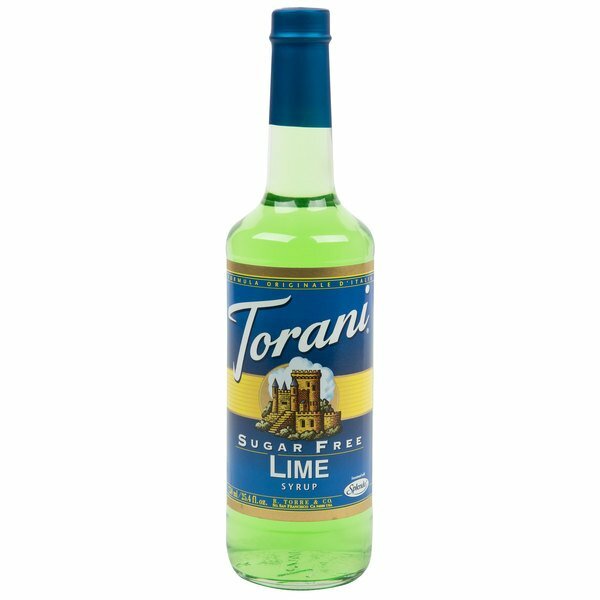 Bring all new flavors to your specialty drink menu with this Torani sugar free lime flavoring syrup! It's sweetened with Splenda brand sweetener, which offers the taste of real sugar without the calories. This tempting flavor will complement your beverages without overpowering them or being too sweet, while the user-friendly bottle will be convenient for your busy baristas to use. Torani flavoring syrups are specially formulated to resist curdling in milk and to hold up well under heat, making them the perfect choice for espresso-based drinks, brewed coffee or tea, and more. Use this flavor for frappes, iced coffees, smoothies, and even baking! Add a shot of sweet yet tart lime flavoring to any drink with this sugar free lime mixed drink flavoring syrup! Mix up a classic mojito or margarita, or create your own sweet and sour, fruity cocktail. Discover new Torani recipes for this flavoring syrup, including a light lime refresher, sugar free lime iced tea, sugar free lime Italian soda, and sugar free strawberry smiles soda! Put the lime in the coconut? YES! put this lime in any coconut drink and it is amazing. So happy to have found a sugar free option. Such a great and fresh tasting fruit syrup and the fact that its sugar free is great. A nice lime flavor that is perfect for adding to our colas and tea. The torani sugar free lime flavoring is great for spicing up my diet sodas. The lime flavoring is so fresh tasting and is perfect for my summer drink menu. This is really good for doing a sugar free limeade with sprite! Yummy! Not As great as lemon but I'd buy again for sure! Love this website as well! Can't wait to pour over crushed ice this summer! Best part is that it is sugar free. Being diabetic is always so "treat restrictive" I can enjoy all I want! Do you have fond memories of certain flavors from your childhood? Well I have many, all from being at my Nanny's house watching her cook, and tasting all of her delightful creations. One of my favorite pies that she made was her Key Lime Pie. It was light, airy, refreshing, seemed to melt as soon as it hit my mouth, and just a cool summer sensation. I have re-created this heart warming flavor of my younger days with Torani Sugar Free Lime Syrup. Oh the sweet memories and exactly how I remembered it! This was a great discovery for us. We are all fans of Italian sodas and limeade sodas. Since this is sugar free and not expensive, we are able to enjoy them more often. Delicious!!! I use this product along with the Torani Sugar Free Raspberry Syrup to flavor my soda water. It makes a delicious low calorie treat! 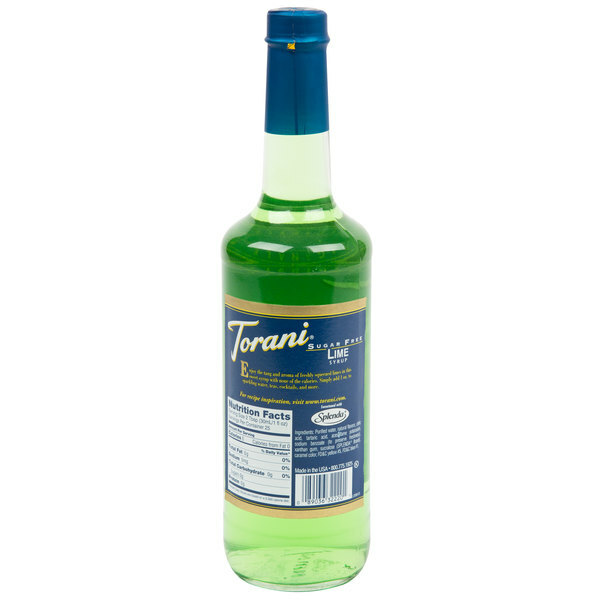 Torani's sugarfree Lime syrup has a low flavor level and is rather sour when compared to the DaVinci Sugarfree Lime syrup. In my opinion, Davinci's is superior. Love using the sugar free torani lime syrup to add a splash more lime flavor to my diet lemon lime soda. Great price is offered here too. Great tasting and sugar free. What else can you ask for? Use it for shaved ice, its awesome. I will add to water to have a nice lime drink. I recommend!